This is a picture of the Harvard Computer Room in 1890. Can you see the computers? There are eight of them in the picture. 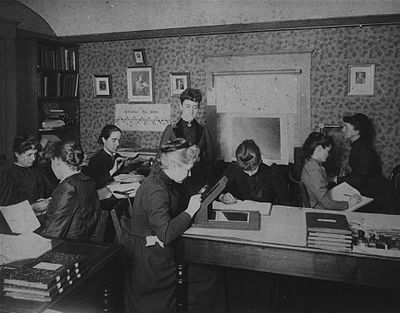 Seven of the computers are seated and the eighth, Williamina Fleming, is standing. She was the first woman to be given a formal appointment at Harvard. There were also computers at Greenwich and in Australia, and basically at any serious observatory. The Dudley Observatory in Albany, New York, had more computers than anywhere else. As we all know, "computer" means a woman who worked in a nineteenth-century observatory, doing cutting-edge scientific work for little pay. I suppose that the word may have picked up other meanings since, partly thanks to Ada Lovelace, who we celebrate today.